One thing that sets Dr. Paul Early apart from his colleagues is his thorough examination and consultation. He is committed to getting to the root of your problem, rather than simply treating your symptoms. Dr. Early’s years of experience give him an edge in identifying and resolving chiropractic concerns. Your first examination at North Star Chiropractic Center begins with a motion palpation assessment and orthopedic, neurological, and chiropractic tests. Orthopedic tests involve putting stress into the joints to try to reproduce the pain and locate its source. This tells Dr. Early about the health of the joint. Neurological tests will help him identify which nerves are involved in causing your pain. 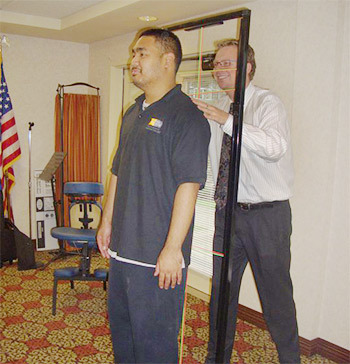 Chiropractic tests will reveal the health of your spine and help Dr. Early determine whether you are a good candidate for chiropractic care. Dr. Early relies primarily on a manual adjustment technique called Diversified, which forms the core of your recovery plan. Combining chiropractic care with rehabilitation and massage therapy takes your healing to a new level. We’ll treat your joints and soft tissues, then we’ll work to help you stabilize and strengthen your body to maintain your results and remain free from pain. When you approach your health from multiple angles, you get better results. We treat the whole body and the whole problem, using a more comprehensive approach. You don’t have to live with your pain any longer. Contact our office to schedule your consultation today.